A lovely three-bedroom house in a large complex of luxury villas. Complex is located on the foothill of the mountains, just 15 minutes from the center of Kyrenia. 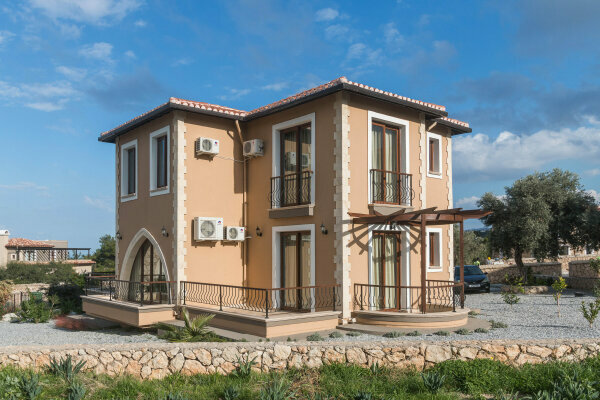 This place has everything for permanent residence: a convenient location, pine forests surrounding the complex, and, of course, the endless Mediterranean Sea. You can enjoy the views from all windows and from extensive (76,5 m2) terrace on the second floor of the house. Pine forest carefully covers the complex from the outside world, providing complete peace and tranquility, but without overlapping the beautiful views of the surrounding nature. There are 9 villas of this type for sale now.